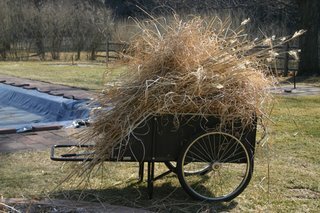 I have been doing some Spring cleaning in the gardens and today I was cutting down the dried grasses in the pool garden. 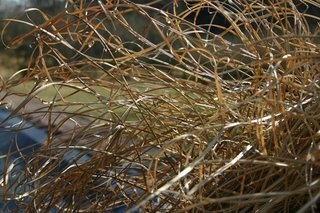 I was piling the bunches of grasses in the cart, but then turned around an noticed how beautiful the golden grasses looked in the afternoon sun. Now if I only had the time to act on this inspiration! As everyone knows, I use as little salt as possible in my cooking. Also, as people who have eaten my side dishes know, I give you plenty of vegetables and in interesting combinations. Some of those side dishes were my vegetarian main dishes. Having said that, I also need to say that the menu this year has changed completely. We are serving Latin American dishes (Colombian, Venezuelan, and (New) Mexican) with a Valencian Paella. There’s no seafood in that Paella. Remember, Colombian and Venezuelan cuisine usually does not have hot peppers in it. It’s more like Spanish Cuisine which tends to use Paprika more than habineros. (Paprika comes from the Hungarian word for pepper: paprika. Paprika can be hot but it can also be mild. It can be smoked as well as hot or sweet (mild).) The (New) Mexican/California pozole, with fresh tortillas, flour and corn, is a little on the spicy side but I’ve toned it down from where I like it (HOT!!) and I’ll let you heat it up with hot sauce. I’ve also left out most of the beans and some of the rice people normally associate with Latin food. Of course, Paella has rice but only one thin layer of it. Mostly it’s veggies, broad beans and green beans, with the meat Chicken and Rabbit. I’m leaving out the snails. Gasp! We have one fish dish, with a caviar blini side, on Friday. It’s everyone’s favorite. We also have three chicken dishes, one pork dish and one beef dish. Next year I’ll have a lamb dish, I promise. Yes, I did away with the maple salmon. Sorry. I want to make that Paella and you’ll love it. Some people don’t eat beef. I’ve created a braised pork that I feel, and Kim agrees, is wunnerful. For those that don’t eat pork, I have several chicken and one, gasp, lamb dish, that I’ll be holding in reserve. For those that are concerned about health, weight, not eating meat at all or are allergic to wheat, milk, nuts etc. I have an alternative menu that is mostly veggies with, if desired, the meat dish that we’ll be serving that day. So, if I am serving a dish with milk in it and you are allergic to it, give the alternative menu a try. And please don’t forget, EVERYONE can order half or quarter portions if they desire on all the menus. Don’t forget, salad dressing that is oil based can have as many calories as a dessert! So, forgo dressing and eat those desserts! Unless, of course if it is one of my famous lite dressings, e.g., my blackberry vinaigrette has 50% less oil than a normal vinaigrette. I use blackberry and vinegar with a juice base and some oil for flavor. I always use extra virgin olive oil. (Being Italian, you’ll probably use more butter on your bread in one night than I’ll use in my cooking all day. Including breakfast. Most butter that is eaten at the Arms is eaten on bread.) So, eat salad sure but don’t forget that dessert! Dessert? We always have the ever popular fruit cup and other wunnerful desserts that don’t involve massive amounts of chocolate, sugar, cream, butter or other high caloric yummies. Don’t be shy, tell us what your food restrictions are and we’ll get you food you can enjoy. You can always get our fruit cup. 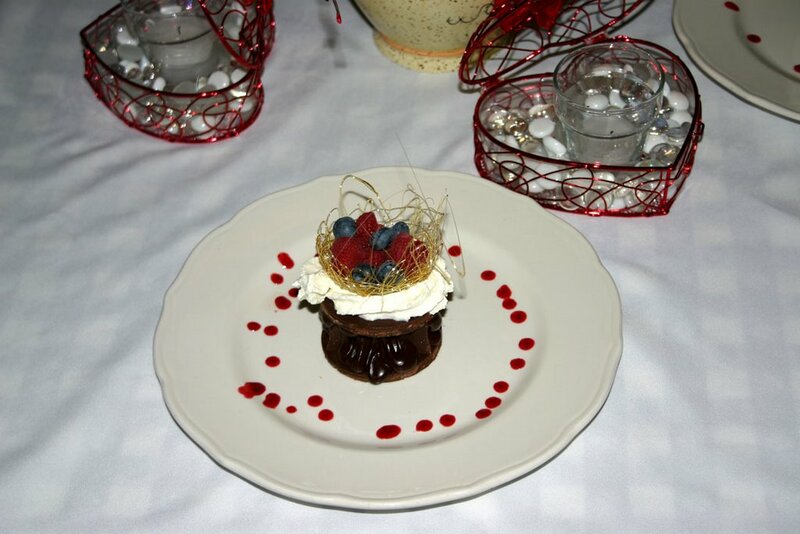 For the rest of you, indeed, we’ll have at least two chocolate desserts and our famous cheese cake. I changed the sauce I put on it. I think you’ll love this dessert. 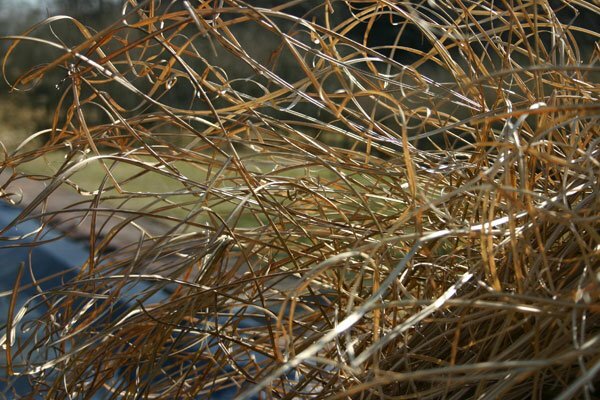 I did a poached pairs this winter that everyone raves about and you’ll also see this this year. Remember, I grew up as vegetarian, and a health fanatic, as did my brothers. So, I understand the frustration when going out to a restaurant and not being able to get anything but overcooked, oversteamed veggies that just don’t taste all that good. I believe in interested combinations of vegetables and letting those flavors show through. Right, one trip to Mexico, well, to be fair I lived in Colombian and Mexico as well as Sweden and France, and I fell off the vegetarian wagon. So, for you meat eaters, I’m ready. We have ribeye steak!! Two sign ups for 2007! Wow! 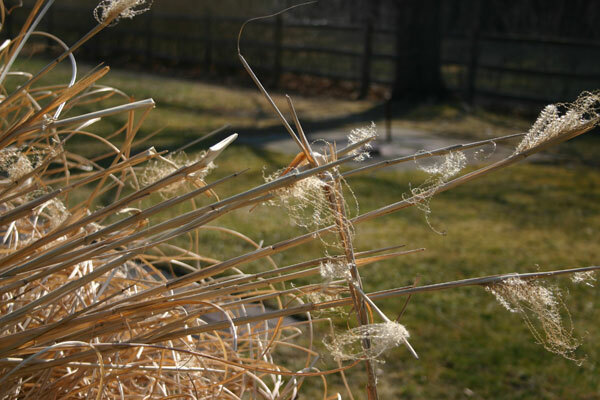 A group of people from Australia have signed up for Paula Nadelstern’s fiber art workshop next year! So far, two of the three we are expecting have signed up. That’s just fantastic. A fourth is a non-quilter but very welcome. Coming from Australia, they want to make sure that they have space in the class. We are taking sign ups for all classes at this point. So far, so good. Winter Workshops were terrific. I’ll be doing a Valancian Paella, no seafood. The traditional paella doesn’t have any seafood. I’ll be doing my own version, of course. Well, yesterday we went to Platforma in the theatre district. Very good. Nice Brazilian Churrascuria! Great food and a wonderful salad bar with sushi. I have been toying with the idea of doing a Brazilian style BBQ. Then we went to a restaurant that was an Asian/Spanish confusion, I mean fusion, restaurant. The food, especially the bread, was good but the cocktails were terrible. It was called Toro and it’s close to the water. We were not allowed into the River Cafe because we weren’t formally dressed. What is formally dressed to this pimples? A jacket! Ha. White time is formal. Black time semi-formal and a suit and tie is informal. Everything else is casual. We were slummin’. This morning we went to Tom’s in Brooklyn, always a fun experience. We saw the William Wegman show, all in Brooklyn, and then we went back to Manhattan to go to Bobby Flay’s Bolo. I was expecting great food and was disappointed. It was OK.
First I was served a Sidecar so bad that I had to send it back. And this after drinking a good sidecar at the Flatiron Lounge. Ouch. And then I got a mediocre glass of temprenillo. When the first thing you eat or drink at a restaurant is unpalatable, the rest of the meal goes down hill no matter how good. If the apps aren’t very good, then the main course isn’t going to even register. At least at Spago, the apps are always good. I think Bolo is probably at the level of Spago, maybe. Bolo should have made up for it on the desserts but it didn’t. And so, confusedly, Spago is much better. 3 Licked Fingers. We had 8 tapas, and out of the eight, only the potatoes, and I feel the anchovies were good. Kim liked the duck liver. I thought it had a too smoky, too burnt taste and smell. I expected much better than we got. Kim had the risotto and thought it smashing. The hit of the evening, though I thought a little heavy handed with truffle oil. I thought the spinach side was very good. The rest of the table, except Kim, thought it had too much orange juice in it. I didn’t taste orange as much. I had the lamb shank and thought it only fair though Kim liked it. I thought it was too heavy and sticky. Overcooked orzo? You betcha. When we finally ordered the dessert tapas, I only liked three of the twelve, the ganache, the lime sorbet and the passion fruit. We spent 5 times what you would spend having dinner at the Arms. Kim, who has only eaten once at Jardiniere, thought it better than Jardiniere. I must admit that the first time I ate at Jardiniere, the one time with Kim, it was only OK. The subsequent times proved the charm. The tasting menu there was fantastic. Wait a minute. Hold the presses. Kim and I have eaten there quite a bit Apres and before opera. She just admitted that Jardiniere and Bolo are, to her, at the same level. OK. I don’t buy that but I’ll live with it. Bolo is better than Boulevard, but not as good as Rubicon which is on par with Jardiniere. Bolo isn’t even in the same room as French Laundry or Fleur de Lys though French Laundry is better than Fleur de Lys. It’s probably on par with Spago. However, the desserts aren’t as good as Spago when they had their fantastic pastry chef, lo these 10+ years ago. She went to Jardiniere. I don’t know where she is now. Sigh. There are so many desserts that are called Death By Chocolate. I prefer to call this new one Life By Chocolate. After all, what is Life Without Chocolate and what is Chocolate Without Life? This dessert, which I have not yet completed designing, is going to be two disks of 62% dark chocolate, Shaffenburger, probably, mixed with Rice Krispies, Between the disks will be a thick ring, thicker than these pictures show, of raspberry and Kahlua truffle ganache made with, I think, an equally dark Valrhona (or Callebaut as the desserts in the pictures are made of) chocolate, and in that ring will be raspberries or perhaps a raspberry sauce. Then on top of the top disk, I’ll put whipped cream and a sugar basket. In that basket, and I’m still playing with the design as you can see, will be raspberries and blueberries. I’m also toying with a chocolate mouse as an alternative filling. I’m also toying with putting mascarpone in between the disks and enrobing the whole think with a dark ganache. I think I may just do a treasure chest mold of, perhaps, Dagobah chocolate with a nice Callebaut chocolate mouse in it. I’ll decorate the plate with crushed chocolate nibs. Not only am I bgetting the roasted nibs from Dagobah but I’m getting single country chocolates from them. All organic too. The mind boggles! I’m also going to do a mini banana split with a chocolate pate. Now for the pictures. These pictures really don’t do this dessert justice. Don’t worry, I wont make it too big! Just big enough to satisfy. 😉 Ah, the difficulties of photographing food! Sigh. When Kim sets up her art photography area, we’ll be able to use it to photo food and give you a better idea of what the new dishes look like. This is the best picture so far but just doesn’t give the dessert the justice it deserves. Another variation on the basket. It looks like a bad hair day but in actuality this looks very cool. and another cool looking one. And we see it at table. Close up of cool, though too burnty tasting, basket. and the rest of the boys. I’ll be putting more of the plating designs up later. We’re getting some new plates too so I plan on using those to showcase some dishes. Here we go on our journey of Ann Lindsay’s Winter Workshop. Those that missed these wonderful winter workshops, for whatever reason, my heart goes out to you. Not only art, but also how to easily section a grapefruit. And successes. It’s about the WHOLE experience people! Remember that. It’s about painting and eating and having fun! Fun in the, well, snow? Not a lot of that this Winter. Yes, it’s about the experience. Why Doesn’t Kim Blog more? Revealed! I’ve often asked myself why Kim, my wife, doesn’t blog more. I think I’ve come up with the answer. She has her own blog about her studio, Crazy By Design! So, if you are interested, and you should be, go to her Crazy By Design Blog! Well, here’s hoping she also continues blogging here.